Credit: Reproduced with permission from Cecilia Bleasdale. 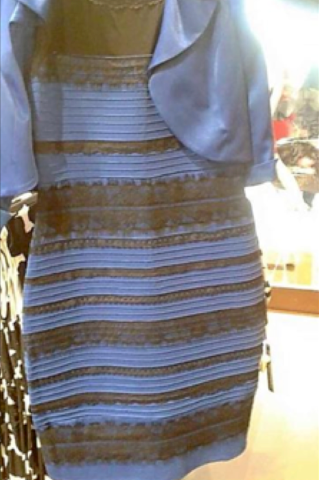 When "the dress" went viral in 2015, millions were divided on its true colors: gold and white or black and blue? In a new study, New York University neuroscientist Pascal Wallisch concludes that these differences in perception are due to our assumptions about how the dress was illuminated. "The original image was overexposed, rendering the illumination source uncertain," explains Wallisch, who serves as a clinical assistant professor in NYU's Department of Psychology. "As a result, we make assumptions about how the dress was illuminated, which affects the colors we see." "Shadows are blue, so we mentally subtract the blue light in order to view the image, which then appears in bright colors—gold and white," Wallisch continues. "However, artificial light tends to be yellowish, so if we see it brightened in this fashion, we factor out this color, leaving us with a dress that we see as black and blue. "This is a basic cognitive function: to appreciate the color on an object, the illumination source has to be taken into account, which the brain does continuously." The study's participants, who had previously seen the dress, were asked whether or not they believed it was in a shadow. Wallisch then considered what could explain these findings. He hypothesized that differing perceptions could be linked to one's exposure to daylight—quite simply, people who rise and go to bed early, and spend many of their waking hours in sunlight (i.e., under a blue sky), are more likely to see the dress as white and gold than are night owls, whose world is illuminated not by the sun, but, rather, by long-wavelength artificial light. To test this, he asked participants if they go to bed early and feel best in the morning (i.e., "larks") or if they like to sleep in and feel best at night ("owls"), then matched this self-identified circadian type with how they saw the dress. Consistent with the hypothesis, larks were significantly more likely to see the dress as white and gold—relative to owls—underscoring the relative effects of exposure to daylight. "This suggests that whatever kind of light one is typically exposed to influences how one perceives color," Wallisch says. "The answer—based on this research - is 'not necessarily'," Wallisch observes. "If illumination conditions are unclear, your assumptions about the illumination source will matter, and those might depend on lifestyle choices, such as when you go to sleep." Interesting. I see gold and blue although the gold could be brown in shadow. What were the actual colors? I don't know why all of these experts talk about human perceptual biases, but I have never seen any of them comment on the camera and display. None of us has actually seen the dress; we are seeing a picture taken by a digital camera that cannot register the full color gamut, compressed and transmitted over the internet, interpreted by a CPU/GPU according to some standard or other that does not include the full color gamut, and displayed on a monitor that cannot handle the color gamut even if you had it available, and that almost certainly has never been calibrated. None of us is looking at the object. Each of us is looking at a shadow of a reflection of a guess, and we are all looking looking at different ones. What really needs to be explained is how anyone agrees on any two color pairs in this situation. It is very easy to see it in either set of colors. If you look at the image without much ambient lighting, it will tend to look white and gold. Now, turn a bright light source toward you while you are looking at the dress and suddenly it will look blue and black. It could all just be due to the lighting level around a person when they viewed the image. Your pupil contracts with brighter light, and apparently that change also changes the perceived color. I guess that sounds reasonable, except that I never even considered that it was artificial light and dont see how someone could think that. The background totally looks sun lit. Did anyone here see it as indoor lighting? Yes, I see it as artificial light. The way the colors look seems like a really bad photo taken with a digital camera that has the wrong settings, while also in really bad lighting conditions. The top right corner has reflected light looking white like you'd expect sunlight to be, but if you check the bottom corner of the mirror you can see a reflection of the wall, which is bright yellow looking. Then below the mirror you have white looking paint on the wall that fades into a yellowish tinge in where the light isn't as strong. Looks like really basic off-white paint and incandescent lighting. What I don't get is why people think the dress is in a shadow. There are shadows on a couple parts of the dress. Shadows with sharp edges from protruding bits blocking a strong light source shining on it from above and slightly to the left. You also see highlights on the fabric. I've had older digital cameras produce similar looking bad pictures indoors, so that's what I think of right away.